Looking for more fundraising ideas? Whether it’s a longest drive contest or a lucky duck race, we can help you with ideas that will help increase those fundraising dollars while keeping participants entertained. Tournament season is here! Are you looking for a unique way to sell more sponsorships, increase attendance and raise more money at your event? If you’ve already added a putting contest or sho ot-out, this could be the year to take flight by holding a giant-prize golf ball drop. A golf ball drop is a really fun way to attract attention, increase community involvement and raise more funds! And it’s easier than you may think. It all starts with selling numbered golf balls. Donors purchase balls in hopes of winning your grand prize – up to one million dollars, paid for by Hole In One International’s sister company, Odds On Promotions. A few days prior to your event, Odds On Promotions will preselect a few winning ball numbers. On the day of your event, you’ll drop all of the balls you’ve sold onto a designated target from a helicopter, hot air balloon, crane or bucket truck. If one of the balls landing inside the target area matches one of Odds On’s preselected numbered balls, the owner of that ball will head home a winner, and Odds On will pick up the tab! Want to learn more? Watch one of the videos below, then give us call at 800-827-2249 and one of our Odds On Promotions’ representatives will be happy to give you a quote. Looking for a great fundraising idea that will draw a crowd? How about insuring a few golf promotions? That’s what this nonprofit medical center in the state of Kansas did, by insuring a few unqiue golf contests, with the assistance of not only Hole In One International, but our sister company, Odds On Promotions. Here are how the golf promotions worked: Come the day of the golf tournament, 75 of the players, invited via exclusive invitation, participated in a golf shootout contest, where if any of them made a hole in one from the specified 155-yard par 3 hole, they would win $50,000… compliments of Hole In One International. While unfortunately, no one ended up making the prize shot, there was still good news to be had. That’s because 20 of the those players were invited to come back and participate in a second golf shootout contest — this time, from the par 3 18th hole on the course, which measured 165 yards. The players were qualified in various ways. The 16 golfers who were closest to the pin from the prior shootout contest were invited back, 2 players qualified via auction, 1 via putting contest, and 1 via a chipping contest. If one of the twenty golfers managed to ace the 18th hole, they would have landed $1,000,000 for themselves and $1,000,000 for the medical center, which mainly focuses on cancer research and treatment. That’s a cumulative $2,000,000 prize… paid for by Odds On Promotions! While no golfers managed to make a hole-in-one, money was still raised for the medical center and fun was had by all. Make your next golf tournament or golf outing a huge success by advertising the chance to win big, compliments of Hole In One and Odds On Promotions! Want every single player in your tournament to be given a chance to ace a hole and win the big bucks? Then check out our hole in one insurance! Give us a call today at 800-827-2249 for a free, no-obligation quote on any golf promotions of your choice… or email us for more information or with any questions you may have! We’d love to help make your next big fundraising event a success. Helicopter Golf Ball Drop Can Help You Fundraise at Your Golf Outing! Calling all non-profit organizations: raise more dough this season with a helicopter golf ball drop! Looking to add a little something extra to your annual golf tournament this year? How about a helicopter golf ball drop? That’s right — thanks to Hole In One International’s sister company, Odds On Promotions, this promotion can be insured at your next golf tournament… and for a nominal fee! Plus, a helicopter golf ball drop can help you maximize those fundraising dollars! The way it works is simple: sell as many sponsorships as possible by having individuals purchase numbered golf balls for a fee — how much you choose to charge them per ball, or per bundle of golf balls, is strictly up to you! Contestants can either make their purchase at a specified location or better yet, online via your organization’s website! Want to reward those who register and pay for their golf balls in advance? Feel free to cut them a deal and discount the price of their golf ball(s) if they make their purchases x days prior to the registration deadline! Come the day of the event, the helicopter will lift into the air and drop all of the golf balls onto a target area. If the numbers on the balls which come closest to the target match Odds On’s preselected list of numbers, then they’ll be a grand prize winner… of any insured prize amount you choose, up to $1,000,000! Wondering where in the world you’re going to manage to obtain a helicopter from? We encourage you to team up with one of your local radio or TV stations. You’ll get them publicity, and in return, you’ll gain use of their traffic helicopter! 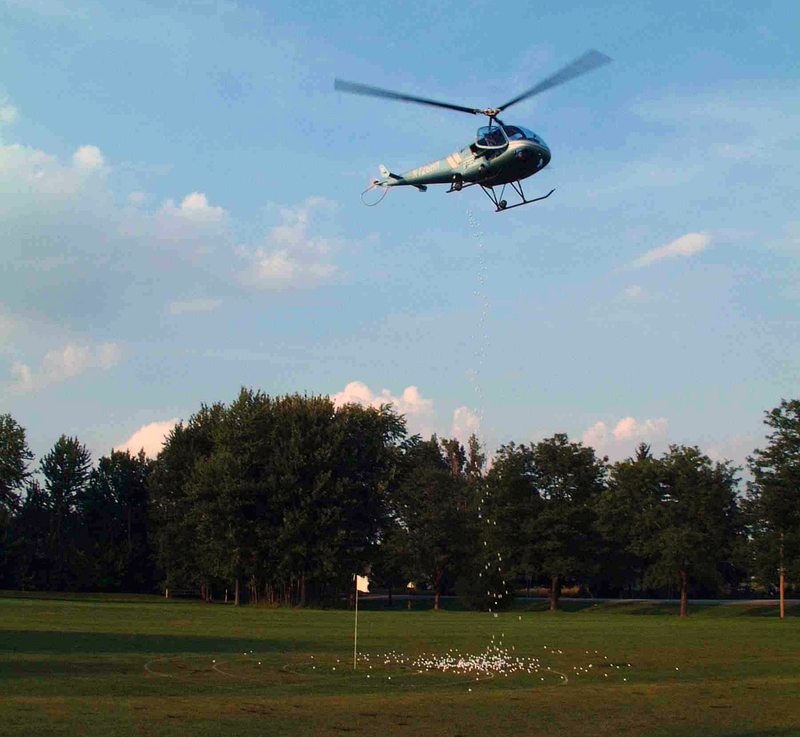 A helicopter golf ball drop is an attention-grabbing promotion which can be held before or after your golf tournament. In fact, it can even be insured as a stand-alone event, if you so choose! Pick up the phone and give Odds On a call today at 888-827-2249 for a free, no-obligation quote on a helicopter golf ball drop promotion. You can also email them with any questions. Wondering what a helicopter golf ball drop looks like in action? Wonder no more: just check out the video below!